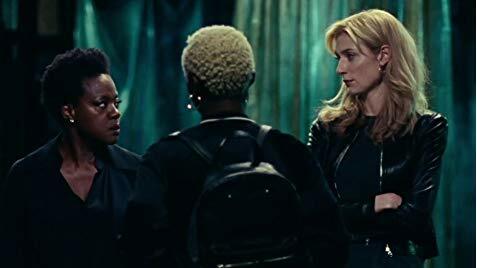 "Enthralling" Heist Thriller 'Widows' Gets Four Stars: Read the Review! Consider Widowsa more electric, less-frothy version of the caper Ocean’s 8. . . only it’s infinitely better than that sounds. In fact, referring to it as a caper veers on insult. Let’s instead call it a superbly crafted thriller featuring a blockbuster cast — I think Colin Farrell is billed seventh —and a story that comments on race, social class and gender. It’s also as massively entertaining as any popcorn movie you’ll see all year. The engrossing action starts with a cannonball of an opening sequence that showcases the visual talents of 12 Years a Slave director Steve McQueen. As we’re introduced to each of the main characters, the film abruptly cuts away to a heist job gone wrong. Specifically, a getaway van driving away from trouble, dodging gunfire. The criminals, one of which is played by Liam Neeson, end up dead. The money is burned up. Our heroines are the titular characters they left behind. Wealthy Veronica (Viola Davis), wed to Neeson’s character, lives in a high-rise Chicago apartment with an adorable white fluffball of a dog; Linda (Michelle Rodriguez) is a small-time business owner and newly single mom; younger Alice (Elizabeth Debicki) is your classically gorgeous babe in the woods. Dealing with the loss of their husbands is sobering. Coming to grips with the fall-out is terrifying. The men they stole from? Sleazy political crooks in Chicago — including two rival candidates (Colin Farrell and Brian Tyree Henry) — with vengeance coursing through their veins. To pay off the debts, Veronica comes to the realization that she must finish the job herself. She corrals the other two women for help. Together, they pool their resources, transform into criminals and take care of business. In the third act, a gung-ho hairdresser (Cynthia Erivo, also the stand-out from Bad Times at the El Royale) joins them as the getaway driver. But the heist isn’t just about these widows getting their hands on the cash. The world has long underestimated and undervalued these women. The time is now to prove them wrong. 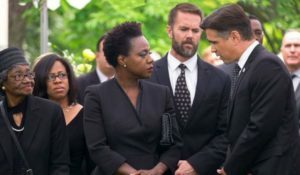 Each actress brings something delicious to the table in Widows. Davis has a no-nonsense determined aura even when draped in nothing but a white towel in a women’s locker room sauna. Sample line: “We have a lot of work to do — crying isn’t on the list.” Rodriguez and Erivo are never afraid to get their hands dirty. Debicki is a revelation as her fragile character evolves into an independent woman. In one snappy scene, she takes the great Davis down a few pegs in the process. They all must maneuver around powerful and violent men, including a henchman played by Daniel Kaluuya. The recent Best Actor nominee is so mercilessly cold-blooded that the pathological suburban family in Get Out would high-tail it in the other direction. First-rate performances all around. There’s a not-so-subtle allegory in the narrative about class struggle, but we didn’t necessarily come here for social warfare. The real fun is watching these women piece together their plan and track down their getaway vehicles. Shooting practice is a treat, though I could have done without the peculiar scene of Debicki trying to persuade an older woman into buying her guns. The women don’t always agree but there is no doubt that they are utterly capable. The final showdown between good and evil is nothing short of jaw-dropping. I don’t use that cliché lightly. This review is crazy. Worst movie ever – no character development (of anyone), weak plot, shoddy camera work. Mick LaSalle of the SF Chronicle gets it right. This was a terrible movie .